As technology continues to lead society’s future, computers in the classroom are a common sight. From elementary grades throughout graduate school, schools are granting approval for the use of computers in the classroom. Each school is different regarding the use and frequency of computers in school and there are debates regarding the benefits and the risks. Whether schools allow students to have individual computers or allow time in computer labs, one thing is certain: more children are using computers in their off-school hours and are becoming proficient in modern technology. For those who have used computers in the classroom, the benefits are unquestionable. More teachers are finding the connection with computers one that enhances and benefits students’ learning and expands knowledge; however, teachers must supervise all computer use in order to achieve the greatest educational benefits. Children and teens should never have free access to surf websites unsupervised in the classroom. Using individual computers in the classroom often falls under the category of blended learning. This style of learning is when instructors incorporate several methods for delivering content to students. Some teachers use computers with special needs students as tools to help overcome communication issues. Computers may be used to help share assignments, engage in various activities, provide real-time communication experiences with others regardless the distance, enhance or expand lessons and increase knowledge. Mobile computing is becoming a popular mode of learning and schools are embracing technology outside of the computer lab and in the classroom. Individual computers in the classroom often increase a student’s engagement level in the activity, lesson or assignment. A computer helps children focus on the project at hand and can be a vital tool for maintaining a student’s interest in the topic learned. 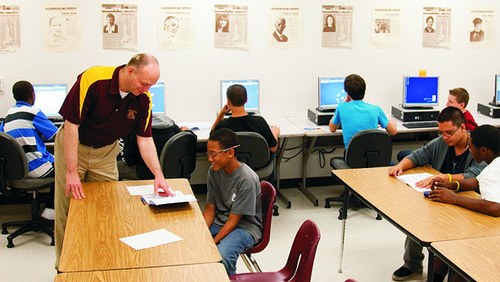 Many students are genuinely interested in modern technology and will naturally engage and participate simply because computers are in use. Teachers can revitalize boring lesson plans that quickly lose a child’s interest with computers and modern technology. Computers are fun and most students learn and retain more when having fun while learning. Computers bring an element of hands on learning to the classroom that is engaging and mentally stimulating. One of the areas in which modern technology has revolutionized the world is communication. Today, computers (and modern technology in general) have made it simple to make phone calls overseas, video chat in real time with people on the other side of the globe and have enabled communication that was virtually impossible a century ago. Teachers can bring students and living experts together through virtual connections. A teacher’s class of students may not be able to board a plane and fly to Antarctica for a hands-on lesson, but they can view the area virtually, use Google Earth to survey the icy land, and speak with scientists in real time. Virtual field trips are an excellent learning tool and would be impossible without the use of classroom computers. Today, children can connect with experts in any field through computers and have a fuller, more rounded understanding of their lessons. Students can chat with an astronaut, author or physicist or view an event they otherwise would miss, simply by having access to computers in the classroom. The world is changing rapidly. Innovation may be the only thing that precedes technology. New discoveries, inventions and algorithms continue to take society in new directions. Students who are not fully immersed in the technological revolution will be ill equipped to handle the future world. Students entering college without computer skills are at a clear disadvantage and need to catch up with their technologically proficient peers. Children and teens are using computers and technology for fun, gaming and entertainment, but teachers and school administrators should not overlook their educational benefits. Bringing computers to the classroom helps ensure students are ready for the world ahead. Computers in the classroom help create adults who will find their place in a technologically advanced society. Not only do computers in the classroom assist teachers with individual lessons and expanding students’ knowledge, but they are also preparatory tools for the future. Is there a Podcast in your Classroom?